The festival will be opened on May 6 by the Marjanishvili Theatre which will present As You Like It, a comedy by William Shakespeare. The performance will be in Georgian with scene synopsis in English. “The director of the comedy is Levan Tsuladze and we will perform six times from May 6-11 at the Globe Theater,” Tamar Laliashvili, press manager of Marjanishvili Theatre told Georgia Today. 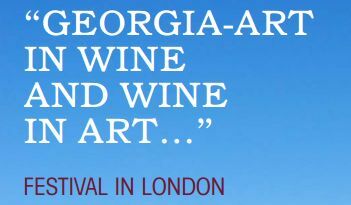 On May 12-18, London will host the Art exhibition –Art in Wine, a weeklong exhibition at the Nati Gallery. As the title reveals, the theme of the exhibition is wine. The exhibition will display a collection of works from contemporary Georgian artists like Guram Tsibakhashvili, Koka Tskhvediani, Kote Jincharadze, Lia Shvelidze, Oleg Timchenko, Maka Batiashvili, Mamuka Tsetskhladze, Mikheil Eristavi, Misha Shengelia, Niko Tsetskhladze, Tako Chokhonelidze, Tamar Kanashvili, Ushangi Khumarashvili, Vakho Bughadze and Zurab Gikashvili. For wine lovers, the most interesting part of the festival may prove to be the events on May 17, when Chateau Mukhrani, will present its wines at the Vinopolis where three wines– Shavkapito, Goruli Mtsvane and Tavkveri will be featured in a tasting. Located outside Tbilisi, in Mukhrani village, Chateau Mukhrani prides itself on its wonderful palace, garden, vineyards and wine cellars, and most importantly, the outstanding quality of its wines. Abashidze thinks that the interest towards the festival is high and that interest continues to grow. “London is like a trend-setter, which means that what’s important in London is important for the other parts of the world,” Abashidze said. During the festival, Georgian wine brands will participate at the RAW Artisan Wine Fair from May 19-20. RAW is a two-day exhibition featuring the best wines in the world. Featuring over 150 growers, including a selection of Georgian Artisan Wines, RAW is one of the most exciting collections of fine, natural wine artisans. The Georgian stand at RAW is sponsored by the Georgian National Wine Agency. The festival will conclude with a film screening by Otar Ioseliani, an award-winning Georgian director. His Falling Leaves will be organized on May 21 at the Cine Lumiere. After the screening there will be a Q&A session with the director. The film, a 1966 masterpiece is not only part of Georgian cultural heritage, but is also the first film ever to question the use of additives and manipulation that have become common place in modern winemaking. Isabelle Legeron, France’s only female Master of Wine, the UK’s most fervent natural wine champion and a world authority on traditional Georgian wine, will introduce the wine tasting. BGCC, which is a non- political trade body that aims to facilitate business growth and contacts at senior levels between Britain and Georgia, was founded in 2007 and actively organizes Georgia-related events in London. The festival was initiated by the Ministry of Culture and Monument Protection and is supported by the Georgian National Wine Agency. Abashidze hopes that such festivals will become annual event and every May will be marked as Georgia’s month on London’s calendar.